Telluride Real Estate Corp. is pleased to present the comprehensive market report for the first quarter of 2019. 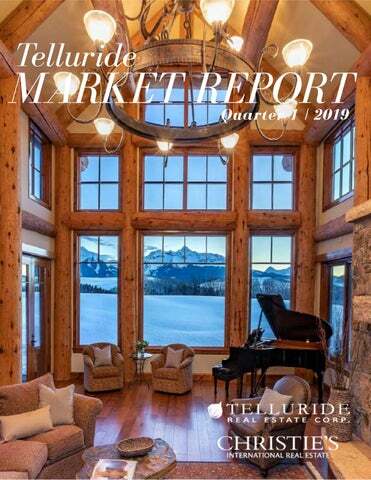 This report provides an overall snapshot of the market as well as detailed information on the different market segments making up the Telluride region. Telluride Real Estate Corp. TRUSTED. EXPERIENCED. PROFESSIONAL. SINCE 1981. Telluride Real Estate Corp. / Christieâ&#x20AC;&#x2122;s International Real Estate is proud to be one of the most established real estate brokerages in the region, with a team that includes over 40 licensed brokers, assistants and staff members. Our organization is comprised of only experienced, successful and dedicated full-time real estate professionals. Our partners are deeply embedded in the community, having been directly involved in the planned development of the Telluride area as a world-class ski resort. Our owners and the majority of our Telluride real estate agents are long-time Telluride locals who are passionate about their careers and about living in this spectacular mountain town. In a sense, we are ambassadors for this community, bringing Telluride to the rest of the world. In addition, the partners, brokers and assistants that make up the TREC team are some of the regionâ&#x20AC;&#x2122;s most dynamic individuals â&#x20AC;&#x201C; a group of people on the cover who share energy, enthusiasm, a sense of purpose, and an ability to get things going and get things done. Featured Listing Real estate is about personal relationships, and we strive to provide 120 Aldasoro Boulevard an unrivaled experience for our buyers and sellers from beginning to end and beyond. All data in this report is collected from Telluride Consulting and the Telluride Multiple Listing Service. All information is deemed accurate and reliable but is not guaranteed..
Market Highlights Facing Headwinds, The Telluride Real Estate Market Advances External factors well beyond our boutique regional market (volatile equities, China trade concerns, national political gridlock, etc.) have imposed some uncertainty in the minds of some of those seeking the sanctuary of a second home mountain investment. On the other hand, there are still those that place family lifestyle and a solid real estate investment a notch above a “zip lock” on paper liquidity. The first quarter of 2019 yielded a 4% increase in gross dollar sales ($114.8M vs. $110.3M) over that same period of 2018, despite that quarter riding the “coat tails” of the new tax law and a burgeoning economy. In fact, March sales demonstrated a 16% increase in gross dollar sales over the prior March, suggesting that momentum is on an upswing. Overall, transactional numbers are almost exactly the same quarter to quarter. Sales in the Town of Telluride ($48.1M vs. $37.8M) continue to demonstrate strength with an increase of 27% (Gross Dollars). Although Telluride Mountain Village condominium sales remained stable with $27.2M in sales, the lack of sales of single-family homes was a factor in that market’s decline of 20%. The balance of the Telluride Region received renewed investor focus with a 32% increase (Gross Dollars --- $22.37M vs. $16.9M). It is certainly noteworthy that, looking back March to March over a two-year period, sales on the upper end of the pricing spectrum in the Town of Telluride homes (above $1000 PSF) are holding value with 18 sales during each of those periods at nearly identical average PSF’s in excess of $1200. The sale of Telluride condominiums experienced almost identical results for these time periods with 12 sales each at an average PSF of $1172. This would certainly lead one to believe that values are stable, and with several condo projects under construction garnering higher contracted prices, values could very well be on the rise. Trends indicate that a large December can lead to a smaller January as many may be trying to buy or sell for tax purposes. In January there was 1 single family home sale and 3 condos in Telluride, which could be attributed to a limited inventory of single-family homes. February saw its largest sale of Plunge Landing, Unit 1-3 (Depot Lot 3); a Telluride nonresidential property, for $5.7M. Two vacant residential properties sold for a total of $2.325M. March saw its largest sale of $12.27M in Block 12, a Telluride non-residential property located next to the post office. There were two Telluride single-family home sales totaling $5.775M. Although January showed San Miguel County being below the 5-year average dollar volume and lower dollar volume than individual years 2016, 2017 and 2018 for January, there has been an increase in dollar volume throughout each month of the 1st Quarter. The area is exhibiting another great trend as it is well above the prior 5-year average ($105.92M) for 1st Quarter dollar volume. In January there was 1 single-family home sale and 6 condos in Mountain Village. There was a large vacant sale in Mountain Village - Lot 104 & Lot 89-2C for $3.975M - which was the largest dollar volume sale of the month. In February there were 2 single-family homes that sold for a total of $6.225M. There were no Mountain Village single-family home sales in March. A trend in condo sales in Mountain Village could be attributed to changing Mountain Village single-family home styles. Sales for the remainder of the county have increased by 32% in dollar volume and are down 18% in number of sales. There was a large sale of $8.4 million in the Idarado Subdivision (Lot P17). Overall, the 1st Quarter of 2019 yielded a 4% increase in gross dollar sales over that same period for 2018, and March demonstrated a 16% increase in sales over the prior March suggesting that momentum is on an upswing. The balance of the Telluride region received renewed investor focus with a overall increase in gross dollars. Letâ&#x20AC;&#x2122;s talk numbers! Contact us below. 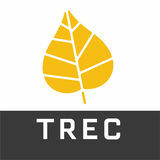 TREC's first quarter of 2019 analysis of the Telluride real estate market.